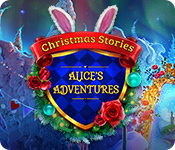 Christmas Stories: Alice's Adventures is rated 3.8 out of 5 by 8. Rated 5 out of 5 by Marja67 from Too Cute. Cute game. Vibrant colors and very pretty graphics. Good stories too. Rated 5 out of 5 by KarenMora from Only for experts The story is dumb, but who does this for great reading? With the exception of The Great Gatsby. That HO was was playable over and over. But I digress. The puzzles are hard. Maybe too hard. I skipped a few. The HO scenes were top notch, but I needed a few hints which isn't normal for me. The music is perfect. Turn the voices off, I found the accents weird and distracting. Rated 5 out of 5 by HeavenBound7729 from The Beauty Of Christmas Enchantment And Imagination! I was a little apprehensive going into the demo, thinking it might be too much of a child's game. Boy, was I wrong! This is a game for anyone who loves fantasy and Christmas and has a thriving imagination. I have never seen such an abundance of Christmas cuteness, everything was simply adorable. It would seriously take me days to finish the entire game, because I would get caught up in just looking at every little thing that came along, Each scene was interactive, clicking an item would cause a reaction or sound. The birds and critters were darling and added extra beauty to the game. The characters, costumes, vocal expressions were excellent. Except, hard as I tried, I could not love that Chesire Cat. He moved at a snail's pace when his help was needed, and he just looked weird! The puzzles and HOPs were very different, I thought. Lots of interactivity and the HOPs were great fun with all the Christmas goodies to search through and I felt the challenge was quite good. The map worked beautifully. The hint and skip settings could be customized in the game modes, I am sure Alice will save the day and save Christmas for everyone, It will be a fun time following along in her endeavor to make everything right. I didn't meet up with her before my time expired...as I mentioned earlier, I was easily sidetracked and became a looky-loo instead of traveling on into the game. So rather than sitting on the fence any longer, I must purchase this delightful, bright little star to add to my Imagination Treasures. This is perfect for the family, no matter what age or skill level. Quality family-friendly games are definitely in short supply in our fish pond. Maybe Santa will bring some more, if we wish really hard! This one gets 5 stars from this old child! God Bless.... Don't Forget The Mistletoe! Rated 5 out of 5 by biscuitsmama from JOIN ALICE AS SHE GOES BACK TO THE REAL WORLD TO SAVE CHRISTMAS Christmas Stories Alice’s Adventures is a breath of fresh air after months of the darker games that came out to celebrate the fall season and Halloween. Thankfully, or perhaps I should say hopefully, we are now past that as we celebrate a more festive and happier time of year. I eagerly await Elephant Games Christmas Stories each year since I loved the Nutcracker that came out in 2012. Since then each year we get another colorful and wonderful Christmas game from this developer. 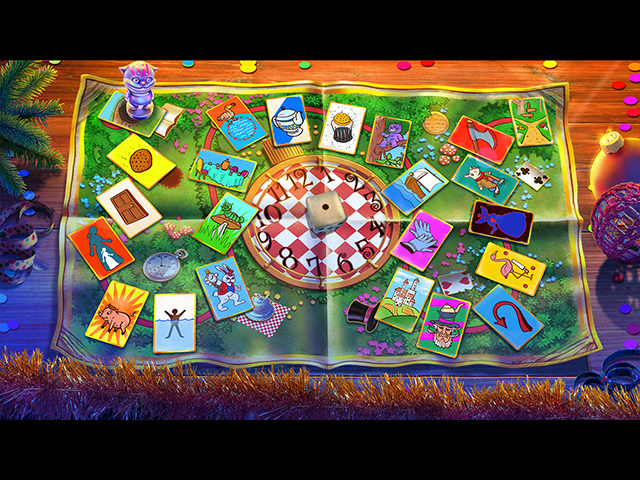 Alice’s Adventure is a family game and one that can be played with younger members of the family to celebrate the Christmas holidays. I’m not going to rehash the storyline since you will see that for yourself but I will tell you that this is a beautiful and colorful game full of the magic that I look forward to in this series. The graphics are beautiful and the characters are terrific. The gameplay is entertaining and filled with wonderful HOPS and great puzzles even though they are fairly easy. This is a light-hearted game intended to lift your spirits and to bring some festive moments to your life. There is variety in the HOPS and some are quite well-crafted. Most of the puzzles are familiar and when you play as many HOPA games as I do, you don’t expect that there will be much that is new. I love searching scenes that are filled with Christmas themed items and playing puzzles that are related to the season as well. For me this is a relaxing game filled with wonder and fun that brings out my inner child. Although many might not like this sort of game, I love Christmas games and look forward to them each year, so for me this is perfect. 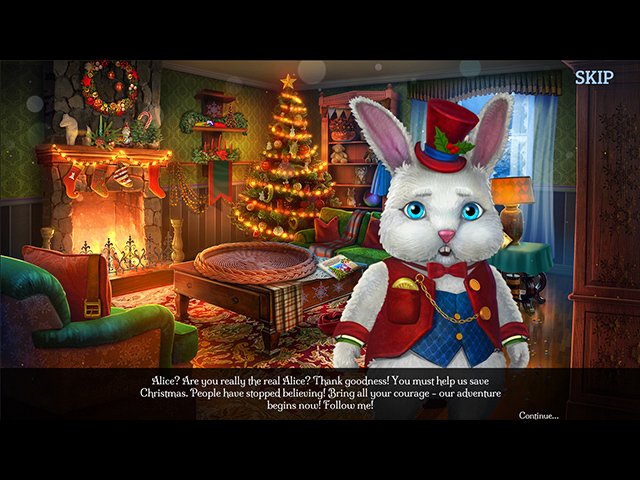 Alice’s Adventures is a fun-filled romp through snowy and festive scenes as she tries to restore the luster to the Christmas Star. Even though this is the perfect kick-off to the holiday season for me, as always, please try the demo to see if this is a game you will enjoy. Happy gaming! Rated 3 out of 5 by deddu from OBNOXIOUS CHESHIRE CAT The graphics are very good, but I didn't like the cat -- he wasn't charming! The game is fairly easy but there is a lot of back and forth to pick up objects that you don't use right away. I found that rather annoying. Always try to see if you like it. Rated 3 out of 5 by LikeAGoodStory from Beautiful Game But Not the Spirit I Sought This is a Christmas game about the spirit of Christmas, a great idea but for me, the story turns into a lot of fetch and carry, not a favorite task of mine in HOPA games. Nonetheless, the graphics are gorgeous so I enjoyed the scenery as I ran back and forth, hoping the story would take hold. That said, this is a good family game, full of good cheer, with the occasional bah humbug character who eventually gets into the spirit. 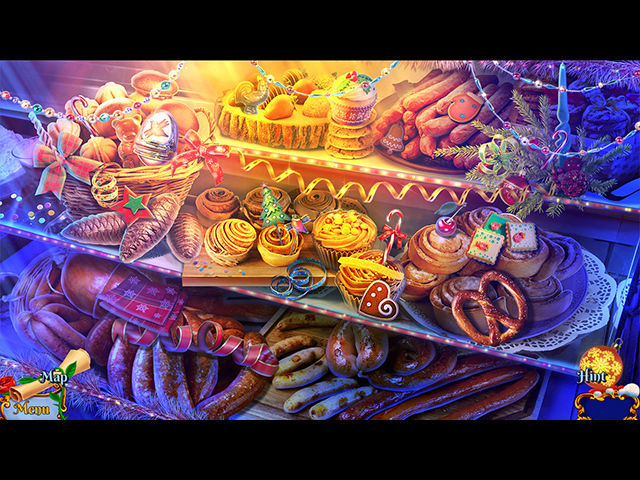 The hidden object games are quite good and the puzzles easy but sometimes a bit confusing in what is needed. However, that may be my issue and not the game's. My review is based upon completed play of the game. Rated 1 out of 5 by MomsAcct from Bah Humbug I have the other games in the series, so was excited for a new one. Only played half of the demo. Its for inexperienced players. Graphics and story were poor. Games were too easy. Overall just not on the same par as the others.